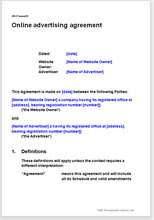 Agreement between a website owner and a business wanting to advertise their products or services on the owner's website, using a paid advert such as a banner ad or skyscraper. Marketing and advertising is a business in its own right. It involves contracts and agreements, partnerships and affiliations, licenses, list rentals, and sales. In the end, your promotional marketing and advertising techniques are only as strong as the contracts and relationships you've built. Use this online advertising agreement to set firm terms with the other party and ensure transparency and success. This agreement has been drawn primarily to protect the interest of the licensor / property owner. This agreement provides a framework for renting advertising space on a website. These terms grant a licence to the advertiser, to use the space (a banner add, or skyscraper) to advertise products or services of any kind. As drawn, the document provides for all ancillary and consequential rights and obligations. Other usual provisions to protect your interests.